If you are a stock trader/investor or an analyst,you should be really really afraid. When market pundits expected markets to fall they rose,when they said they were certain it would fall,the markets rose higher !! Mr Trump is removing ‘Obamacare’,backing out from Trans Pacific Partnership(TPP),planning a wall with Mexico,trade sanctions or anti dumping tarrifs against those who have trade surplus with the US and many other measures whose repercussions cannot be gauged at this moment. Is his strategy really deep or is he a simpleton with limited knowledge,an overblown ego and a perennial foot in the mouth ? As seen from the data,post 1980s US import and export curve almost matches each other signifying goods and services exported to US and revenues used to buy imported products from the US has been about the same. 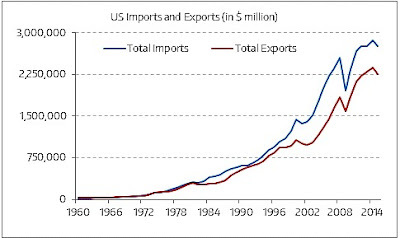 Trade deficit of the USA in 2015 was approximately $ 500 bn.Higher import tariffs will lead to higher inflation and consequently less dollars in the hands of exporters most of which are being invested in US $ backed securities? 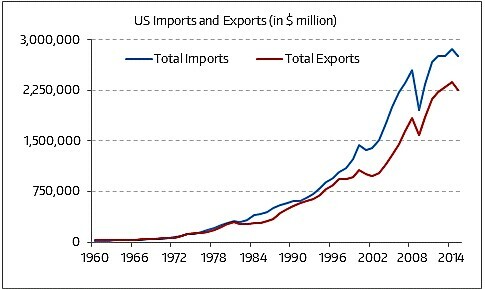 So is reducing imports such a good move ? The Economist defines post-truth as "a reliance on assertions that "feel true" but have no basis in fact." Indian markets on the other hand have continued to climb,the Government figures on GDP seem misconstrued or even a barely camouflaged lie and instead of 30% currency not being demonetized as per Government expectations the fig is only 3%. After all Trump has made it fashionable to be trashy and rude and sexist. The isolationist policies in the US and Britain will enrage the rest of the world and it will not be easy to steamroll China into submission.Neither to tame the ISIS. There is talk of Indian corporate profit growth 10-12% and a GDP of 6.5%.Still talk.Most sectors yet to recover from demonetization,election in the politically vital state of Uttar Pradesh as also Punjab and Goa will be a litmus test of Modi magic. Look forward to the Budget on 1st February with trepidation as this prime Minister seems to see the stock markets as a place of speculation and not as a bellweather of the economy.Are higher ‘service taxes’ coming and maybe a few goodies for the so called “POOR”. The middle class that pays the taxes will probably get a few sops as in housing loan limits getting upgraded but higher taxes in other spheres will make a it sum zero game. The poor remain poor,the rich get richer,manufacturing dies a slow death,Chinese buy up companies,traditions lost,cultures bereft. It is indeed a strange India with all the inherent polarities of the past six decades intact.Only the veneer has changed to saffron. Henry Vivian DeRozio must be turning in his forgotten grave in Park Street as must Washington,Jefferson,Franklin and Lincoln.